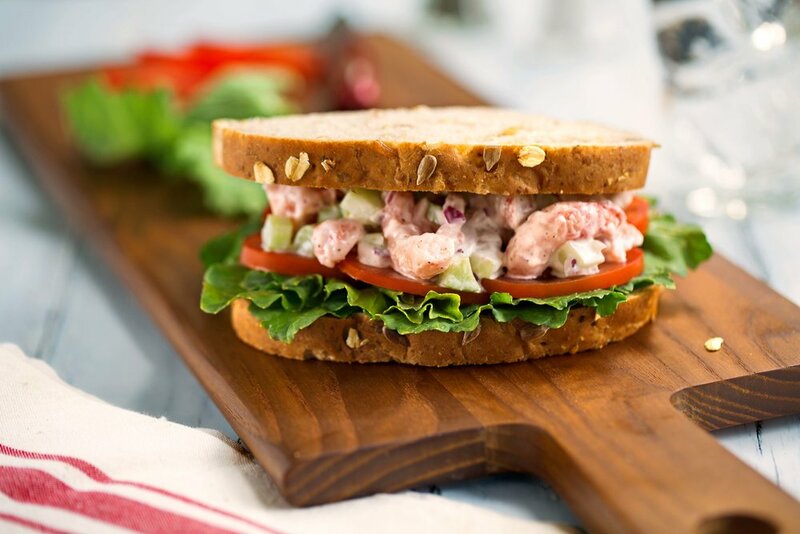 Recipe: Shrimp Salad Sandwich — New Wave Foods, Seafood from Seaplants! Toss together the chopped shrimp, celery, and onion in a large bowl. Separately, whisk together 4 tablespoons of the mayonnaise with the mustard, vinegar, garlic powder, salt, and pepper until smooth. Add the dressing to the shrimp and vegetables, stirring until everything is thoroughly coated. Incorporate the last tablespoon of mayonnaise if you would prefer a creamier salad. To assemble the sandwiches, start with a slice of bread as the base, topped by a layer of lettuce and thinly sliced tomato. Spoon half of the shrimp salad on top, cover with a second slice of bread, and dig in!